Top off your Zelda collection with this magnificent sculpture that’s sure to creep out any Majora’s Mask fan, but only in the best of ways! 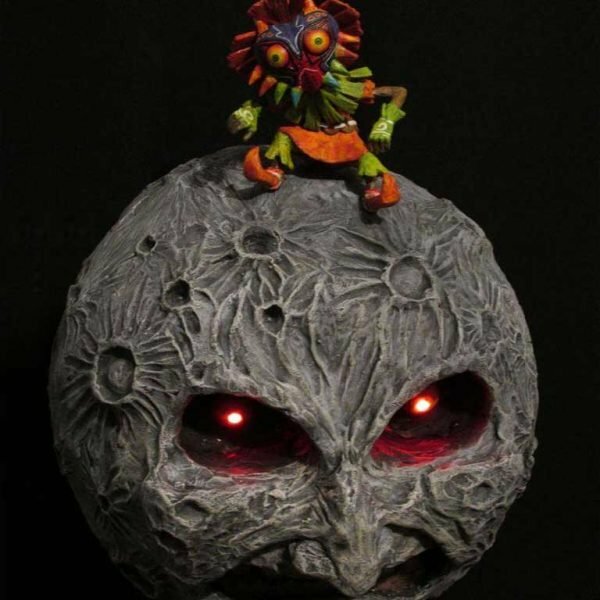 This custom made Termina Moon comes with LED eyes and features a movable Skull Kid figure on top. Get the rupee bag ready because these Spiritual Stones are ideal for any Zelda fan’s gaming area! The replicas are 3D printed to perfectly mimic the ones you ran all over Hyrule searching for. Keep them safe until the Hero of Time appears! Keep your hard earned rupees safe with one of these stylish wallets inspired by the Legend of Zelda series! These hand crafted bifold wallets are each made from eco leather and come embossed in your choice of design. Pay tribute to one of the best video games of all time by bearing a very nutritious bottle of Lon Lon Milk around your neck. This miniature charm might just come in handy when surrounded by enemies with very little health! Have all the Link’s from the Legend of Zelda series follow you as you move around the room. The limited-edition 3D shadowbox is a spectacular addition to any gamer’s room and will come ready for hanging just about anywhere.